On October 5 Turkey’s Hürriyet Daily News reported that «Turkish military sources said a Russian SU-30 breached Turkish airspace for hundreds of meters in the southern district of Yayladağı in Hatay province for two minutes at 12:10 pm [on 3 October], but returned to Syrian airspace after one warning». Two minutes. Hundreds of metres. There was not the slightest danger to any Turkish citizen, aircraft or any other national interest and nobody was in the slightest bit perturbed. But the US-NATO propaganda machine kicked into top gear and fed meaty titbits to the western media whose front page headlines then varied from the shrill «Russian warplane violates Turkish airspace», «Turkish jets intercept Russian fighter plane», «Turkey warns Russia» to the thundering «NATO denounces ‘unacceptable’ Russian incursion into Turkey». The two minutes’ infringement was a navigational mistake – for which an apology was made – but there was no possibility of any clash. The incident was so inconsequential that it did not merit news cover, but the preposterous NATO chief Jens Stoltenberg announced that he had raised «the unacceptable violations of Turkish airspace by Russian combat aircraft» which «are not contributing to the security and stability of the region». Then Britain's ambassador to Turkey, Richard Moore, described the incident as «reckless and worrying,» which assertion is so absurd as to have the merit of risibility. The usual anonymous «US military official» was reported by Hürriyet as having «suggested that the incident had come close to sparking an armed confrontation,» and the propaganda monsoon continued its deluge of disinformation. Stoltenberg managed to lift the trivial affair into the stratosphere of international security and was assisted by the British defence secretary, Michael Fallon, who declared that «our evidence indicates they [Russian aircraft] are dropping unguided munitions in civilian areas, killing civilians». After the BBC reported that «NATO has urged Russia to end air strikes on the Syrian opposition and civilians» the New York Times recorded another «senior administration official» as saying «I don’t believe this was an accident» which «raises questions about basic safe conduct in the skies». The deep irony in Fallon’s allegation about Russia «killing civilians» and the «senior administration official» talking about «basic safe conduct in the skies,» along with Stoltenberg’s absurd and contrived over-reaction to a tiny incident, is that the entire campaign of anti-Russian propaganda took place precisely at the time when there were reports of the slaughter of civilians by a United States air attack on a hospital in Afghanistan. 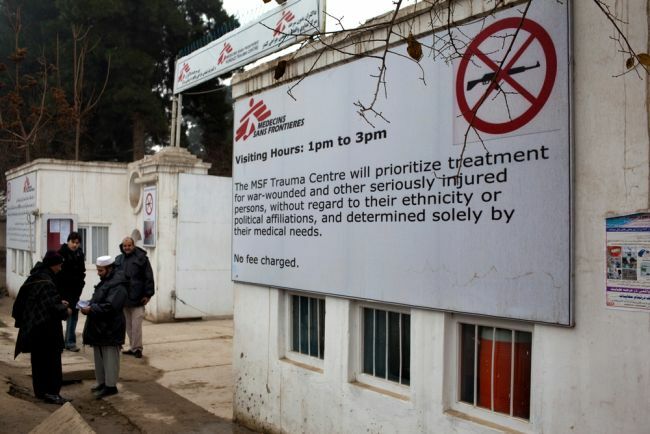 Médecins sans Frontières (MSF; in English, Doctors without Boundaries), is a saintly organisation that provides medical care in many dangerous and disgusting places around the world, in which at the moment there are few more dangerous and disgusting than Afghanistan. It is difficult to have other than deep admiration for its local and international staff. But this doesn’t stop them being killed. Or being called liars by those who kill them. In the early hours of Saturday 3 October the MSF hospital in Kunduz in northern Afghanistan was smashed by airstrikes that killed 22 people including 12 hospital staff and three children, and the Washington Post reported that «a US military official said US special forces were on the ground advising Afghan special forces and authorized an AC-130 gunship to fire at an area that was apparently near the hospital». Following devastation and death came deceit and deception, led by the commander of US and NATO forces in Afghanistan, General John Campbell. This man was reported on 5 October as declaring that US forces had not ordered the airstrikes. He said «We have now learned that on 3 October, Afghan forces advised that they were taking fire from enemy positions and asked for air support from US forces. An airstrike was then called to eliminate the Taliban threat and several civilians were accidentally struck. This is different from the initial reports, which indicated that US forces were threatened and that the airstrike was called on their behalf». There is no possibility that in any circumstances a US military pilot would take orders from a foreigner – any foreigner at all – to carry out an airstrike. The order for the series of strikes on the MSF hospital came directly from a person wearing United States military uniform. It is impossible that this person did not know exactly where the target was located and what it was because no forward air controller can order an airstrike on a target of which he does not know the exact coordinates – and «MSF wishes to clarify that all parties to the conflict, including in Kabul and Washington, were clearly informed of the precise location (GPS Coordinates) of the MSF facilities... these were communicated to all parties on multiple occasions... most recently on 29 September». The attacks and the slaughter were the responsibility of the United States. For Campbell to try to disguise this fact and place the blame on Afghan forces is despicable and dishonourable. His line that «several civilians were accidentally struck» is below contempt. Hungarian MSF nurse Lajos Zoltan Jecs described the savagery. «At around 2 a.m. I was woken up by the sound of a big explosion nearby. At first I didn't know what was going on. Over the past week we'd heard bombings and explosions before, but always further away. This one was different – close and loud... As we were trying to work out what was happening, there was more bombing,» which went on for over an hour. As stated by MSF, «the hospital was hit by a series of aerial bombing raids every 15 minutes. The main central hospital building, housing the intensive care unit, emergency rooms, and physiotherapy ward, was repeatedly hit very precisely during each aerial raid... Not a single member of our staff reported any fighting inside the hospital compound prior to the US airstrike... the hospital was repeatedly and precisely hit during each aerial raid». There is going to be an inquiry, but it will exonerate every US person concerned, just as the inquiry into the night-long US airstrikes that killed 24 Pakistan army soldiers – inside Pakistan – on 26 November 2011 failed to identify the guilty. Not one Pakistani was permitted to give evidence or even attend the inquiry. US-NATO will continue to make claims such as that Russia is «dropping unguided munitions in civilian areas, killing civilians,» while Chief Stoltenberg and all the US-NATO propaganda operatives will concentrate on deflecting attention from the gunship slaughter in Kunduz. They will probably succeed, and the tragedy will disappear from public view. Propaganda usually beats accountability. But it will not bring three dead Afghan children back to life.